Congratulations to Jett Skocny, April Student of the Month. Jett Skocny is a Freshman at Clifton-Clyde High School and is the son of Josh and Molly Skocny. He has participated as a member of the Division I District Championship football team as well as basketball and track this year. Jett has been involved in FBLA and qualified for the FBLA State Conference in Business Procedures. 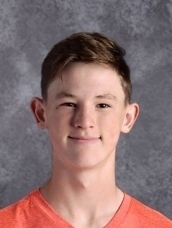 Jett enjoys being involved in the St. John's CYO group and has participated in The Kelly Youth Rally, Feed My Starving Children, and the Salina Diocese CYO Convention where their unit was named The Outstanding CYO Unit of the Year. He has been on the Honor Roll and maintains a 4.0 GPA. Jett is interested in Business and Salesmanship, but is still undecided about his future plans following high school.